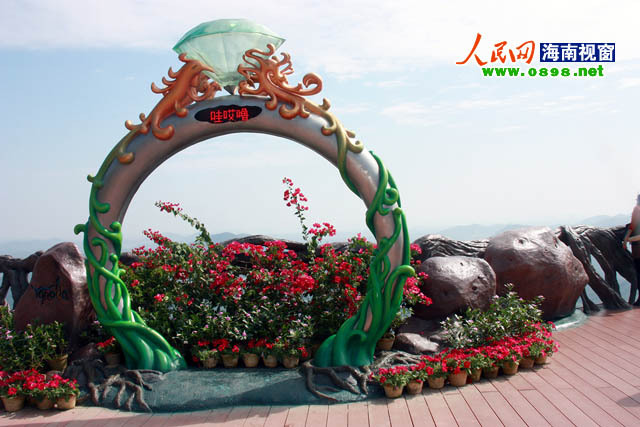 A new scenic spot, “Giant Diamond Ring”, symbolizing eternal love, recently opened to the public at the Seaview Platform of Yanoda Rainforest Tourism Zone. Yanoda Rainforest Tourism Zone is situated 8km from Haitang Bay in Sanya. Looking out from the Seaview Platform, one can see a panoramic view of landscape and the mountainous terrain of Southern China. As the main location featured in the romantic movie Holding Love, the breathtakingly beautiful tropical forest landscape at Yanoda makes it one of the most popular scenic spots for tourists. Meanwhile, a series of wedding themed activities will be staged at Yanoda this October, when tourists will have the opportunity to celebrate their special moment. In addition, a new honeymoon resort within the scenic spot is under construction, which will integrate wedding, honeymoon and leisure tourism to promote the tropical paradise as a honeymoon destination.